Removing Free Radicals From Your Life - Coconut Oil Works: An easier way to use the worlds #1 most beautifying ingredient for skin and hair. The cells in your body need oxygen to survive, but exposure to oxygen causes oxidation. 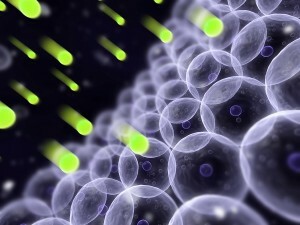 This means that the body’s chemicals are changed to and become what are known as free radicals. Free radicals can also be created from other habits such as smoking, excess sun exposure, alcohol, pollution exposure, and vegetable oils. Scientists believe that these chains of free radicals that build up over time contribute to our body’s aging process and can be harmful to other healthy cells. Coconut oil is another natural free radical fighter. When coconut oil is used in cooking, it helps internally to break up the chains of free radicals that form over time and makes it easier for the body to get rid of them faster. When used on the skin, it helps to keep free radicals away by protecting the skin and membranes from outside sources. The best way to remove and prevent free radicals is to eat a healthy, rounded diet with lots of fruits and vegetables. It is not recommended to take a vitamin E supplement, and those at risk for or who have lung cancer are recommended to stay away from extra beta-carotene. Talk with your naturopath if you have any concerns about your antioxidant intake.